Cheltenham as a Spa never quite competed with Bath or Tunbridge Wells but nevertheless, it was to Cheltenham that King George III came in 1788. He hoped that the Spa water would cure his malady but whilst it may have relieved him temporarily, he later had recurring attacks of porphyry which led to his son becoming Regent. There were several spas more well-known than that of Alstone and though it opened in 1809 and the water was analysed in London the following year and found to be salty and bitter on the tongue, nevertheless it sparkled and looked attractive. But its effects were sometimes rather drastic. It was said the supply was inexhaustible and many claims were made for it and though the Pump Room did not compare with the grander spas in the town centre, it existed for a short time but perhaps because the district was not as attractive as that of Royal Well, or other spas, it eventually closed down, though the premises remained for several years and during the 20th C a petrol station operated from the site and a house nearby was called Alstone Spa House. 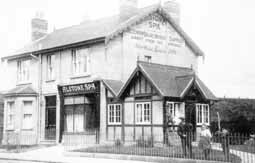 But regrettably, like so many ancient historic buildings, like the swimming baths, Alstone Spa too, gave way to the developers. Outside the heat was very excessive and the crowd pretty large. Inside, although the place looked very cool, and the spectators were rather packed, a look of agreeable surprise was depicted on everyone's face on entering the handsome building which has been designed by Mr. McLandsborough - and in everyone's mouth was a word of praise for the place. And praise was indeed deserving. The bath looked wonderfully fresh and clean and its naturally pleasant aspect was considerably enhanced by a tasteful display of bunting and a number of fine palm trees which had been lent by Mr. Heath for the occasion. In length the bath is 90' feet and a width of 36'. There are 6' of water at the deep end and 3'6" at the shallow end. It holds together 100.000 gallons of water which will be replenished daily. The bath is very nicely furnished, the boxes being of polished pine oiled and varnished. The roof has iron properties and is boarded diagonally and glazed with Beadles Patent System of glazing. At the upper end of the bath is a diving board which was improvised as a platform and on this the Mayor took his stand with the aldermen and councillors on either side. Behind them were Mr. Matthew's chorus. In front of the Mayor were three articles covered with tissue paper, which excited some curiosity which was satisfied later on. The proceedings opened with Councillor Lawrence, Chairman of the Bath Committee requesting the Mayor to declare the Bath open. He remarked that it was just one year since the Corporation got permission from the Government authorities in London to borrow �5,000 for the purpose of building the Bath. Two months afterwards it was commenced and now they saw it finished. For that result there were two persons mainly responsible, one of whom was Mr. Collins, the builder of the baths who had performed his task in an admirable manner and the other was a well-known gentleman, an officer of the Corporation, their engineer, Mr. McLandsborough who had devised it and carried it out in every detail to its present complete state. The Corporation hoped that it would not only be useful to the townspeople during the summer months but in the winter also, as the building had got excellent acoustic properties and they hoped it might be used for large free concerts for the working classes and people of Cheltenham. (Applause). In making the presentation, Mr. Collins said he felt it a great honour to be allowed to present to the mayor these articles as a small tribute of the esteem in which the inhabitants of Cheltenham held him for the social virtues and abilities, and influence which he had exercised through a long life, for the borough of Cheltenham and for the benefit of the working classes. They had assembled there that day partly to pay a tribute to him and also to wish that he might long live to exercise that same salutary influence, and that when his honourable life was ended he might receive a crown of glory. (Cheers). His worship, who was deeply affected, in replying to Mr. Collins, said he was not prepared for the presentation. He had known Mr. Collins for 42 years and the more he knew him, the more he respected him. He received the presentation with hearty gratitude and thanks. His worship said that the Corporation of Cheltenham had done much to improve their public thoroughfares, to complete their sanitary arrangements and to increase their water supply and he and he considered that they had acted very wisely in providing public swimming baths which had long been wanted in the town, and which he trusted would be properly used by those by those for whom they were provided learning to swim, he considered, should for, a part of the education of all children - (hear hear) and he trusted the rising generation would take advantage of the facilities now offered them to acquire the valuable art much had been and much more might be done in providing public swimming baths in different parts of the town. He trusted also that the time was not far distant when they should have proper recreation grounds for the inhabitants of the different districts. It afforded him very great pleasure upon this auspicious occasion of |Her Majesty's Jubilee to be able to open the first public swimming baths provided by the corporation and he trusted they would one and all agree with him that the buildings in which they were then assembled was well fitted for the purpose for which it was built. The building was complete: the internal arrangements were everything that could possibly be desired and it reflected the greatest possible credit upon their engineer Mr. McLandsborough in the way in which the work had been carried out by Mr. Collins gave the corporation the greatest possible satisfaction and reflected very greatly upon him for the way in which he had discharged his duties. At this point the mayor was interrupted by a splash and upon looking in the direction whence the sound came, a little boy was observed struggling in the water, and he appeared in imminent danger of drowning, when Mr. Wetherel, with praiseworthy promptitude, plunged in clothed, as he was, and reached the lad. The action was the action of an Englishman and was thoroughly appreciated by the onlookers who gave Mr. Wetherel ringing cheers as he retired. It is said the boy did not lose his balance but fainted. The mayor continuing said that he . . . which the Mayor called for three cheers for the Queen and unnecessary to state, the appeal met with enthusiastic response. Three very hearty cheers were also given to the Mayor and Mr. Wetherel for his very plucky conduct. The old 100th hymn and the Doxology were sung and the ceremony was over. The procession re-formed and wended its way back to the municipal offices where it a stop being made in Clarence St. to cheer for the queen.